Chapli Kababs are made with beef, but who don’t like beef then they can use chicken. 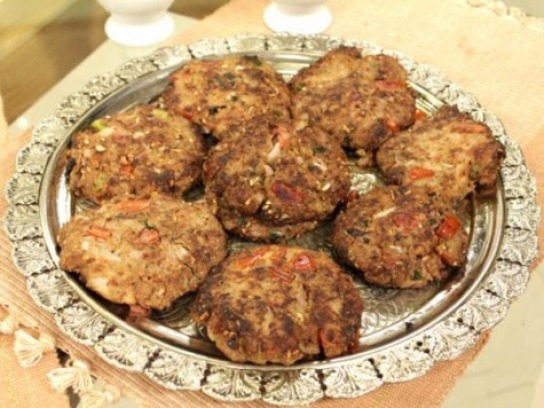 This recipe is especially for those who are looking for Chicken Chapli Kabab. The original recipe is from Chef Zubaida Tariq that is made with 1 kg chicken mince and call for corn meal. I made this with half quantity and substitute corn meal with corn flour. Let find the recipe and try Chicken Chapli Kabab for a tremendous taste. Beat eggs and fry like omelet. Keep aside. Grind together whole coriander, black pepper and cumin seeds. In a bowl put together chicken mince, corn flour, pomegranate seeds, salt, crushed red pepper, fried eggs, ground mixture of black pepper, tomatoes, green chilies, onion, and mint leaves. Mix all and leave for 10 minutes. Make Pattie and shallow fry in a frying pan.